So I was wandering around the internet the other day and stumbled upon a neat little program to help one get control of their email attachments. It’s called OutlookAttachView. 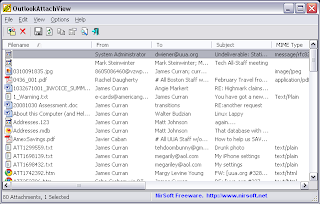 It makes a sortable list of your email attachments, and from there you can delete or save them. You can download it yourself, but we’ve installed it on the network for you. Just click here select open or run to the window that pops up and it will create an icon on your desktop. It’s a great way to clean out the attachments that are hogging your Outlook email space. Note that if you have a lot of attachments, it may take several moments for the list to be resorted when you click on colu mn headings. I should note that I found it on Lifehacker, a wonderful blog that features helpful computer tips and tools.